There is no denying that the entry-level sedan segment a.k.a. 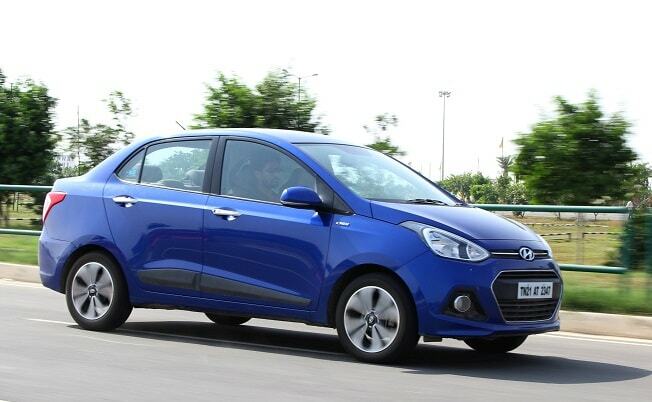 the sub-compact sedan segment is amongst the most competitive segments in India. It fields some really capable cars like Maruti Swift Dzire, Honda Amaze and Hyundai Xcent, and each one of them is on its respective manufacturer's top-sellers list. While these three had been ruling the roost ever since they first arrived in the market, Tata decided it was time they pitched in too. Fast forward to August, 2014 and the segment added a new name to the list, the Tata Zest, which not only offers several exciting features, but is also the most affordable in its league. We had been itching to find out how the new entrants in the segment fared on the road, so we took the Amaze, Xcent and Zest for a spin. As for why the Swit Dzire was left out of the comparison, for starters, it is a comparatively old product. Also, it has been constantly selling more units than the other three cars put together. So, the question really was 'who gets the number 2 spot'. 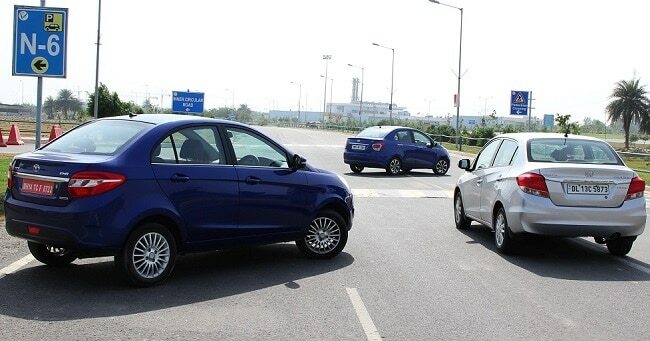 Note: The three models that we tested were all diesel versions, whereas the Xcent and Amaze had 5-speed manual gearboxes, the Zest that we got had a 5-speed automated manual transmission (AMT). To be honest, I am not a fan of sub-compact sedans. If I had a budget of about Rs 8 lakh, I would go for a spacious hatchback instead of these 'wannabe' sedans. However, that's just me and the truth remains that these cars are selling like hot cakes, thanks to the bigger boots and competitive pricing. While Xcent and Amaze are the booted versions of Grand i10 and Brio, respectively, Zest is the only one to not have been based on a hatchback. 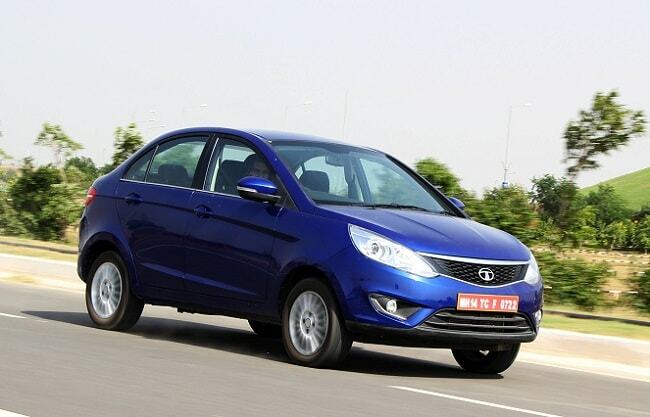 In fact, Tata's upcoming hatchback - the Bolt - will be the cut-down version of the Zest. Now on to business; I found the Zest to be the best-looking of the lot thanks to its aggressive front and no-nonsense side profile. Its rear, however, is a different story; it looks quite dull when compared to the car's overall design. Second on my list was the Amaze - with a well-integrated boot and a plain side-profile, it has the most balanced design though it looks far less sporty than the other two. Then there's the Xcent which sports an attractive front fascia, but a dreadful rear. I think the 'dreadful rear' bit might have something to do with the tail-lamps; bigger tail-lights would have looked far better on Hyundai's sub-4 metre offering. Several studies have shown that today comfort is as important a factor as any other when it comes to buying a car. Perhaps this is why Hyundai cars are doing really well in the market. Anyway, the car that impressed me the most in terms of interiors was the Hyundai Xcent. No points for guessing that one. That said, you ought to know the Zest's interiors kind of shocked (in a good sense), while that of the Amaze managed to disappoint me. Let me tell you why. First the Hyundai Xcent - it offers a good-to-hold steering wheel and the gear-lever position is great. The dual-tone dashboard looks quite appealing, and the overall quality and fit & finish too is probably the best-in-class. However, it gets narrower front seats and considering its width, is good for only four people. 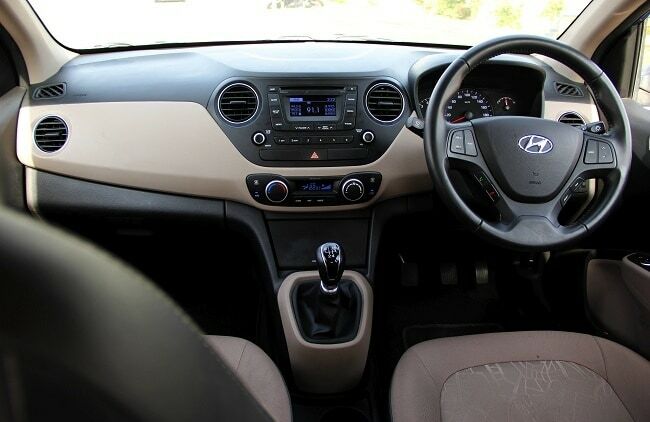 Moving on to the Zest, open the door and you are welcomed by an elegant and well-designed dashboard. A fresh design, dual-tone colour theme, chrome detailing and a stylish steering wheel make it the best looking Tata car under Rs 8 lakh. The plastic quality and fit & finish doesn't fail to impress either. If I were to put it in one sentence, I would say this car has finally managed to help Tata break away from the stereotype that has haunted its cars for so long. About the Amaze, well, this car is as plain inside as it is on the outside. Though the car has been packaged brilliantly and offers the most spacious cabin, the Brio-borrowed cabin is a tad too simple for my taste. I will start off the performance discussion with the Zest. It is powered by a Fiat-sourced 1.3-litre Multijet diesel engine with VGT (variable geometry turbo), which puts out 89bhp and 200Nm. 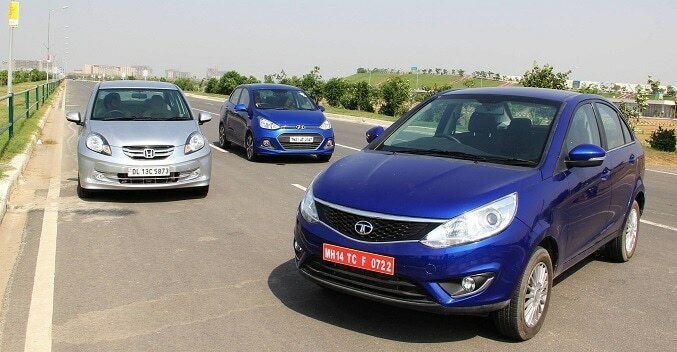 Out of the three cars we tested, the Zest offered the best ride quality. It is fun around corners and its very well set-up suspension handles almost all potholes and undulations with ease. The AMT, however, is unpredictable to say the least. Tata could have definitely done a better job of tuning it with the engine. The AMT took its own sweet time in shifting gears - not only was that irritating, it also resulted in a slower pick up. I found the Zest's engine more refined than that of the Amaze, but the Xcent has greater refinement levels. When it comes to power, the Amaze easily outshines its rivals. 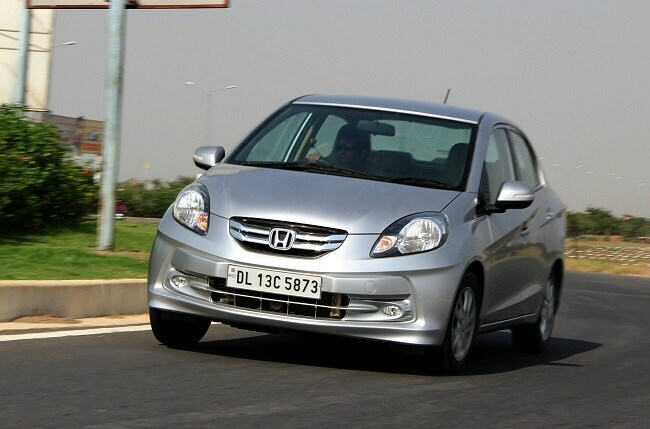 With a 1.5-litre i-DTEC diesel engine under the hood, the Amaze develops close to 99bhp and 200Nm of torque. It feels peppier than the Zest despite similar power figures. The i-DTEC offers almost no turbo-lag and it pulls like no other car in the segment. However, the joy of all that power is marred by how noisy the car is. So much so, that it is difficult to go beyond 80Km/h without switching on the music system. Though its light-steering feels great for city rides, it could have done with a little more weight at high-speeds. In fact, the Zest's steering feels a bit heavier than the Amaze on highways. The Hyundai Xcent gets 1197cc, 3-cylinder CRDi engine that is good for 71bhp and 180Nm and is also smallest out of the three. 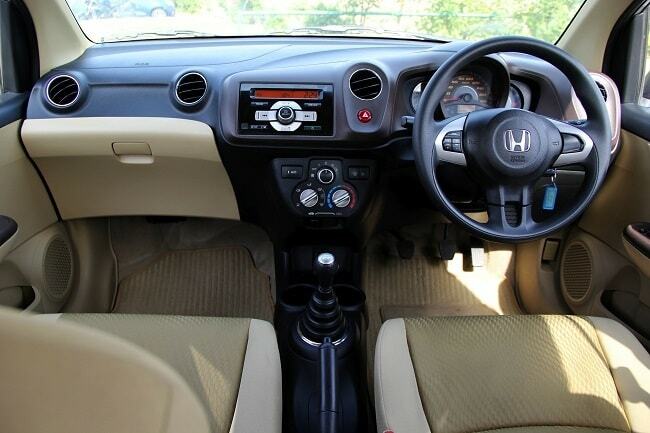 It is a fun car to drive on both city roads and highways and also offers the most silent cabin. Like the Amaze, the Xcent's steering also feels light for highways, but great for city drives. Furthermore, the instant bite from the brakes offers the confidence to keep going at high-speeds. The Xcent is probably best at braking, whereas its rivals - Amaze and Zest - need that extra push during panic braking situations.